This professional HDMI audio decoder can decode the digital LPCM 7.1, 5.1 or 2-channel stereo PCM audio embedded in HDMI into analog surround sound, stereo or digital S/PDIF format so users can make the most use of their existing analog surround sound setup for their HDMI devices. Enjoy the complete digital sonic presentation through their favorite speaker system while watching the HD video on big flat panel TV at the same time. It fully conforms to HDMI standard with full HDCP compliance. The original HD video and audio are directly passed untouched for deep color, 3D, lip-sync,etc through its HDMI output. This multi-function HDMI audio processor has a compact and stylish design. It can be cascaded with HDMI switchers/splitters for achieving larger-scale setup. The analog 5.1/7.1 audio output or optical audio output from this unit remains coming through even when its HDMI output is not connected with a TV. Multi Mode: Switch to this audio mode, all RCA ports output 5.1/7.1CH audio. Optical port output 2 channel LPCM digital audio. And HDMI port output has the loop-through of LPCM 5.1/7.1. [Note]: Source player and DVD disc must have the capability of providing multi-channel audio output for this process. 2CH Mode: Switch to 2CH mode for the HDMI source to output LPCM 2-channel audio per the built-in EDID. So both the front left/right RCA ports, Optical port and HDMI port output stereo analog audio. Mute Mode: Switch to this model, no RCA and no optical audio output. Only HDMI port has the original digital audio content passing through. This HDMI audio decoder is a great device for decoding the uncompressed LPCM 5.1 and 7.1 surround sound output embedded from HDMI output of PS4, Wii U, Blue-ray player or other set top boxes into multi-channel analog surround sound for older non-HDMI home AV receiver, amplifier or sound bar system. [Note]: For Dolby and DTS audio, such bitstream audio can not be decoded by this unit and can only be directly passed through its HDMI output. This HDMI audio processor delivers high-quality 8 or 6 discrete channels for directional and more realistic sonic effect. This HDMI digital to analog audio processor is built with a 24-bit audio DSP with sampling rate up to 192 KHz. The decoded analog audio output from this device produces an accurate bit-for-bit duplicate of sound. Users can fully enjoy the decoded analog output with all sonic details retained from the original HD movie. It also has the added benefit of 4K�2K/30Hz and 3D support, allowing full 4K and 1080p resolution video passing through and eliminating the need to downscale the image for TV. Cost-efficient solution for integrating the new HDMI-based AV equipment into receivers or home theater systems that are not equipped with digital audio decoderthrough using the multi-channel cable or fiber optic cable connection. 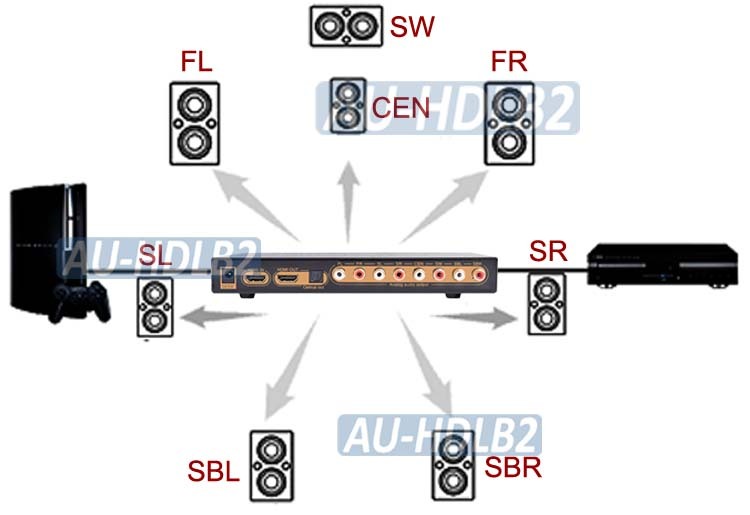 Decodes uncompressed HDMI LPCM 7.1 or 5.1 into multi-channel analog surround sound for amp, receiver or powered speakers. 24-bit DAC with sampling rate up to 192 KHz for accurate bit-for-bit duplicate of sound. Enjoy the decoded audio output with directional sound effects. All sonic details are retained from the original HD feeds after the decoding. No HDMI output connection is required to receive audio from the analog and optical outputs. Featured with EDID dip switch for manual control of audio output mode. Fully compliant with HDMI 1.3, HDCP 1.1 and DVI 1.1 standards. Supports all HD video inputs at 4Kx2K, 1080p, 1080i,720p, 576p and 480p. Supports new 36-bit digital video formats in deep color mode from 25MHz to 225MHz (12 bits/color). Easy front panel control with LED status indicators. Ultra high video amplifier bandwidth up to 2.25Gpbs/ 225 MHz to ensure sharp detailed images and fine audio quality. Supports pass-through of deep color, Lip-Sync, Dolby TrueHD, DTS-HD MA and 3D information. Maximum HDMI bandwidth at 300Mhz.